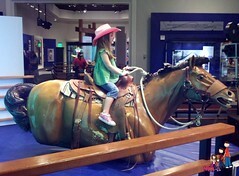 The girls were very excited to visit the National Cowgirl Museum in Fort Worth, TX. We arrived right when they opened at 10 am and were the only ones there. The museum is nice, but not very big. Surprisingly, it was a bit expensive. It is $36 for two adults and two kids, and I am not sure it is worth the price. It is two stories and highlights the stories of cowgirls throughout our nations history. The first floor had a short 8 minute movie and an art exhibit. The second floor had exhibits on past inductees. We wish it had more interactive things to do. The two interactive places were both not working when we visited. Our oldest daughter enjoyed the museum, but wanted to see more. We were there for about an hour. The staff was friendly and overall we liked it...just wish there was more to see. Be prepared to pay a high price. Truly a gem among Fort Worth's Museums! You'll see loads of cowgirl history. Sparkling cowgirl rodeo outfits fill one room, while another offers you the chance to ride a bucking bronc! The Cowgirl Hall of Fame is filled with names you'll know- like Laura Ingalls Wilder (and all her sisters and Ma), Dale Evans and Annie Oakley. Rhinestone studded suits from television cowgirls and country music stars lead you to a small theater where the seats are saddles. Don't miss the area especially for the youngsters- Jessie from Toy Story was a special inductee! Save $$ on your admission by purchasing tickets at the Science Museum next door!